At Scott Orthodontics, we're committed to helping our patients achieve healthy, beautiful smiles that last a lifetime. Dr. Scott and our highly trained team of orthodontic specialists work with each patient on an individual level, designing personalized treatment plans that perfectly suit each patient's unique orthodontic needs. Getting to a healthy smile isn't just about what we do in the office, though. Successful treatment depends just as much on what you do at home - and brushing and flossing are two of the most important things. Brushing and flossing are the cornerstones of a good oral hygiene regimen, but the mechanics change a little bit when you have braces. To brush with your braces, we'd recommend using a soft-bristled or bi-level toothbrush, although an electric can work well if you're careful to keep it to a moderate setting and not hit the back of the brush against your braces. You'll have to brush at least four times a day for two minutes each session: once after breakfast, once after lunch, once after dinner, and once before bed. When brushing, use the brush to cover every exposed tooth surface, and try to angle the brush to also clean under and behind brackets. Use small, circular motions to brush the teeth, lifting away plaque and polishing them clean. Don't forget to brush the inside of the teeth as well as the outside. This small, pine-tree shaped brush can be a lifesaver for cleaning braces. It's great for getting under the archwire and knocking out bits of food that have become lodged in the teeth or braces. This can be a helpful addition to your oral hygiene arsenal. It's a device that shoots a thin, pressurized jet of water at the teeth, dislodging trapped bits of food in the process. It's easy to use and helpful in a pinch, but it's no substitute for brushing or flossing - think of it as a supplement to your regular routine. 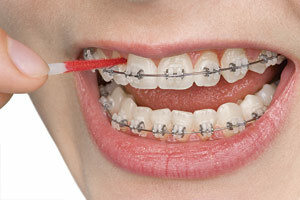 Flossing with braces is a little more comfortable - but it's still definitely doable. To do it, you'll need to use a floss threader, which is a small plastic loop with one long end. Thread the floss through the eye of the loop, then use the long end to feed the floss threader under the archwire. Pull the threader to get the floss underneath the archwire, then floss those teeth normally. Repeat the process for each gap between the teeth, and you're done! So now you know how to keep a strong oral hygiene regimen, but how do you tell if it's working? It turns out there's an easy way: disclose it. You can get special vegetable dyes called "disclosing solutions" or "disclosing tablets" that dissolve in your mouth and release a safe, tasteless dye. This dye lights up hidden deposits of plaque and food, showing you what's clean and where you need to do a little more work. This makes it easy to remove the dyed spots, helping you comprehensively clean your whole mouth. With a diligent oral hygiene regimen at home and the expert orthodontic care you receive in our office, you're well on your way to achieving the beautiful, healthy smile you've always dreamed of. As always, you can call us at (301) 589-8191 for our Silver Spring office or (301) 390-1510 at our Mitchellville office if you have questions along the way, reach out to us at our contact page, or request a consultation online at either of our offices. We can't wait to hear from you!